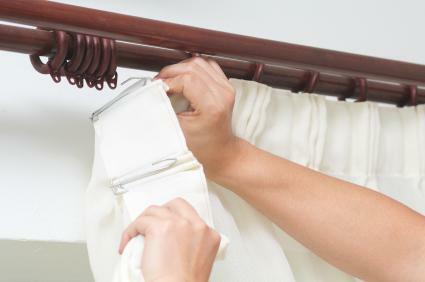 If you're looking for a cheap and easy solution for hanging curtains, consider tension curtain rods. These types of curtain rods can be installed in a snap. Since they save you from putting holes in your walls, they can be a great solution for hanging curtains in a rental property. There are drawbacks to using these kinds of curtain rods, however, including size and overall appearance. The difference between a tension rod and other kinds of curtain rods is the method of hanging the rod. Unlike other rods that are mounted to your walls or window frames using hardware, a tension rod simply fits snugly between two walls and is held in place by the tightness of the fit. Most tension rods are adjustable in length within certain dimensions. You can extend the rod so that it fits as tightly as possible between the two walls. Most rods come with rubber tips on either end to protect your walls from scraping. They are very much like shower curtain rods and work under the same principle. Once you have your tension rod in place, you can hang your curtains. Tension rods are very lightweight. If your curtains are heavy, the rods may not be able to support them, or they may support them for a short time, only to collapse down the line - marking up your wall along the way. You can sometimes solve the problem by using a double rod, but sometimes even two tension rods are not enough to support heavy curtains. Tension rods only work for windows that are on short walls. In other words, the two adjacent walls have to be close enough to the window for you to suspend a rod snugly between them. If the rod doesn't fit tightly enough, your curtains will collapse. If you live in a rental property, tension rods can be a great solution, since you don't have to use any screws to attach the rod hardware to the walls. Note, however, that the rubber ends on the rods can leave marks on the wall. Tension rods are usually significantly less expensive than other kinds of curtain rods. You can get basic tension rods for less than $10. It is difficult to find tension rods that are longer than 84 inches. The reason is that longer rods tend to dip and bow, even when there is nothing hanging on them. Even rods of that length are pushing the envelope. Generally speaking, tension rods work best in small spaces. Although you can purchase tension rods in many different colors to coordinate with your decor, they are just plain, lightweight metal and lack the drama of some more ornate, higher quality rods. If you're looking to make a statement with your curtain rods, a tension rod is unlikely to do the trick. You can find tension rods for sale in all of the big brick and mortar retailers that you would turn to to shop for other kinds of curtain rods. Bed Bath and Beyond, Target, Wal-Mart, Marshalls Home Goods and Lowes are just a few of the places you can find good deals on tension rods. If you prefer to do your shopping from the comfort of home, you can shop on the websites of all the retailers mentioned above. Also, check out Amazon and Overstock for more great deals. Before you make a purchase, be sure to measure the space between the two walls where the rod will hang. Unlike traditional curtain rods, you do not measure the window frame itself. The rod needs to fit wall to wall tightly, so use the measurement of that space as your guide. Likewise, check the maximum weight allowed on the rod before your make your purchase to be sure the tension rod you're getting is up to the task of keeping your curtains in place.